Cult TV series The Prisoner is to be remade into a six-part series for Sky One, the broadcaster has confirmed. Director of programmes Richard Woolfe promised a "thrilling reinvention" of the drama about an ex-secret agent trapped in an isolated village. "If Doctor Who set the standard, The Prisoner raises the bar," he said. 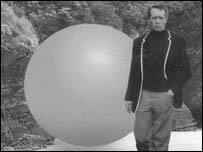 The original series ran for 17 episodes on ITV in 1967, and starred Patrick McGoohan. Christoper Eccleston has been linked with the new show's lead role. "This project has been subject to an unprecedented level of attention, attracting an array of A-list actors and writers," said commissioning editor Elaine Pyke. The new series will be made by Granada from a script by Bill Gallagher, writer of the award-winning series Clocking Off. "The Prisoner is like Pandora's box - it's the ultimate conspiracy thriller," said Damien Timmer, executive producer of the show. "Like 24, the new series will entrap you from the opening scene. We hope it will tap into this iconic show's existing cult following, whilst creating a whole new generation of fans."